When a medical school admissions reviewer finishes reading your personal statement, what are the most important things you want that person to remember about you? Does it sum up your personality, interests, and talents? Does it sound as if it’s written from the heart? It’s pretty obvious to most admissions reviewers when applicants are trying too hard to impress them. Being authentic and upfront about who you are is the best way to be a memorable applicant. What Is The Medical School Personal Statement? 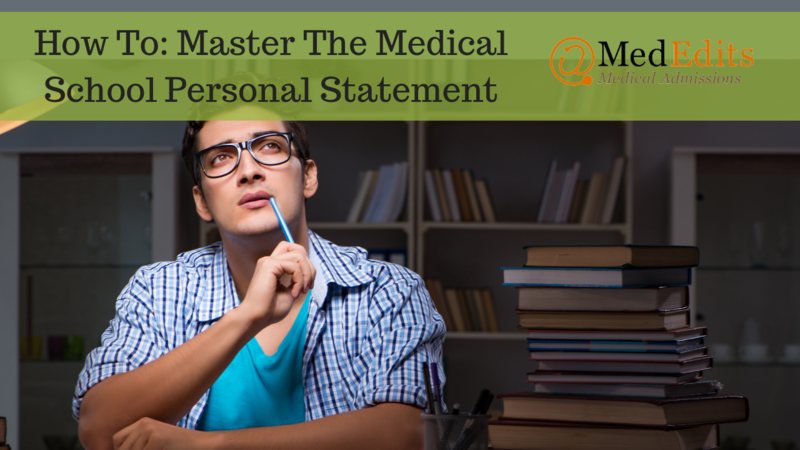 The medical school personal statement is the major essay portion of your primary application. In it, you should describe yourself and your background, as well as any important early exposures to medicine, how and why medicine first piqued your interest, and how you became increasingly fascinated with it. It’s also key to explain why medicine is the right career for you, in terms of both personal and intellectual fulfillment, and to show your commitment has continued to deepen as you learned more about the field. The personal statement also offers you the opportunity to express who you are outside of medicine. What are your other interests? Where did you grow up? What did you enjoy about college? Figuring out what aspects of your background to highlight is important since this is one of your only chances to express to the admissions committee before your interview what is important to you and why. Need help on your medical school personal statement? Sign up for a FREE 15 minute advising session with an admissions expert. The AMCAS personal statement, at 5,300 characters with spaces, offers you the most room in which to flex your writing muscles. But you should still have a plan for how to get the most out of every word. So map out or outline the big highlights in your journey to medicine so far. After your introduction (more on that in the section of personal statement writing tips), describe your background and a little about your family, where you grew up, and what was important to you in your early years. The next paragraph might cover your high school years – and your middle school ones, if your interest in science or medicine started then – and any involvement in science-related activities, health-care volunteering or shadowing. After that, you might devote a paragraph or two to your college years. Don’t forget to write a couple of sentences about your coursework. Although it may sound mundane to talk about your favorite classes, college represents four years of your life, and that’s a big chunk of time. Medical schools want to see what you enjoyed (or didn’t enjoy) about your coursework, and what captivated you about science and medicine in particular. And don’t feel limited to discussing your science courses. We’ve had many clients write convincingly about their interest in other disciplines and how it informed and enhanced their passion for medicine. Medical schools are looking for diverse, out-of-the-box thinkers who can contribute fresh perspectives. So whether you enjoy women’s studies, anthropology, engineering, music, or folk stories, write a couple of sentences about it! And describe how your interest has contributed to your ideas about how you want to practice medicine and relate to your patients. The next paragraph should be reserved for describing any post-college activities, including employment, research, volunteer work, internships, etc. Make sure you leave room for a strong, upbeat conclusion that sums up all the highlights of your pursuit of medicine, and that clearly conveys your passion for and dedication to the field. Related Video: Should you take a gap year? The AACOMAS personal statement is for osteopathic medical schools specifically. As with the AMCAS statement, you need to lay out your journey to medicine as chronologically as possible. So you essentially have the same story map as for an AMCAS statement. But because you have less space – 4,500 characters with spaces, rather than the 5,300 AMCAS gives you – you will need to be even more disciplined about what you include and what you don’t. Most important, you must show you are interested in osteopathy specifically. Therefore, when trying to decide what to include or leave out, prioritize any osteopathy experiences you have had, or those that are in line with the osteopathic philosophy of the mind-body connection, the body as self-healing, and other tenets. If you’re applying to both allopathic and osteopathic schools, do NOT make the mistake of thinking your osteopathy essay is simply a shortened version of your AMCAS essay, with one osteopathy paragraph thrown in for good measure. They are really entirely different animals, and it’s very easy to spot an allopathic statement in osteopathic clothing. A top-notch AACOMAS personal statement will focus on osteopathy from start to finish. In writing your essay, it’s crucial to show you have a solid grasp of what osteopathic medicine is and how it differs from allopathic medicine, in its approach to treatment and patients. And carry those ideas all the way through the statement. If possible, start your statement off with an anecdote that ties into your interest in medicine. This could be a medical event that happened to you or a family member, or a patient with whom you had a special bond. Other topics include an experience that challenged or changed your perspective about medicine; a mentor or another inspiring individual; a difficult personal experience; or obstacles that you’ve had to overcome. Whatever it is, turn it into a mini story, and make it personal and exciting, pulling the reader into your journey immediately. As we discussed in the AMCAS section of this article, the rest of the statement should lay out your journey to medicine as clearly as possible. Explain the major milestones along your personal path, and be specific about why you want to be a physician, using examples from your experience whenever possible. In your writing, try to balance your intellectual curiosity about the clinical and scientific side of medicine – the “hard” side of medicine – with the “soft” side, the human element. Even if your main goal is to be a physician scientist, it’s absolutely critical to establish your compassion and empathy for patients, and to make it clear you can establish a connection with many different types of people. Along the same lines, it’s a good idea to offer some examples of your cultural competence – your openness to the different perspectives, cultures and backgrounds your patients will undoubtedly have. Write honestly and directly about any obstacles, setbacks, or medical/personal issues that you’ve had to overcome. That said, keep your audience in mind. Medical schools want to be certain you’re emotionally and mentally up for the rigors of a four-year medical education. Therefore, although you shouldn’t gloss over difficult or painful subjects, keep the focus on how you’ve grown and become a stronger, more resilient, person as a result of those trials – someone who will handle the challenges of medical school with grit, perseverance and aplomb. Whether she was learning English with me or spending the summer helping me tend our cucumber patch, my grandmother supported my efforts to become the first generation of my family to attend college. Tragically, before my freshman year of high school, my grandmother’s gastric cancer metastasized. The disease spread throughout her system and found its way into my life, challenging my entire way of living. Indeed, the ease and speed with which this invisible force removed the bedrock of my childhood exposed the brutal truth that we are biologic systems vulnerable to myriad threats. At the same time, by witnessing my grandmother’s strength as she inched her way out of bed to prepare herself for treatments, I became increasingly aware of the burning optimism that drives people to extend themselves through uncertainty. This direct exposure to the resilience of the human spirit as it battles disease initiated my desire to serve the infirm. Driven to research clinically relevant therapies and share my time and compassion with patients, my experiences have continuously fortified my desire to contribute to the field of medicine. While still learning the basics of high school biology, a simple interaction with a friend’s father serendipitously gave me a new understanding of the role of science in medicine that inspired me to action. As we talked in his office, he explained his research into a technology for treating a range of diseases. A glimpse at the broad therapeutic potential of this technology proved how science could produce tremendous clinical hope and piqued my interest in research. After completing my freshman year of college, I joined his research team as a summer intern to develop cost-effective mediums to help this investigational therapy become a reality for patients. While meticulously culturing cells in different mediums, graphing their growth and assaying their stability, I understood that my work was not singular and discrete, but that I was contributing to the hope of cancer and infectious disease patients. Realizing that the outskirts of knowledge contain such possibilities for great benefit further motivated me to explore the clinical potential of science. Moreover, my investigations led to awesome observations of swelling lymph nodes, enlarged spleens, and increased production of antibodies and cytokines, all of which affirm a blunt purpose – survival. Ultimately, the brilliance of our biologic reactions inspires my belief that by harnessing the responses that reflect our inherent will to survive, the potential therapies we can offer are unlimited. Still, my admiration for the human spirit as it battles disease tremendously outweighs my amazement at the biologic responses the body launches to maintain health. Bridging all divides, health is our common foundation. Through my work with low-income HIV patients, I have learned about the loss of jobs, estrangement from family, and the solitude inflicted by HIV. The overreaching nature of HIV illustrates the devastating human toll of diseases. Yet merely by remembering patients’ names and providing a listening ear as I serve meals, I provide these patients with a sense of belonging and support. Week to week, whether waking them up from their naps in time for lunch, or helping them find job training programs, I realize the great benefits of even such small acts of compassion, which increases my desire to offer these individuals much more. Equally important, by witnessing the struggles these patients face, even with the latest medications, I am reminded of the need to expand our biologic knowledge to produce better results. Whether witnessing the symptoms of depression relapse after relapse, the infections caused by HIV that destroy an individual’s ability to speak, or the weakness that follows chemotherapy, I am struck by the severity and diversity of biologic threats. Ultimately, the unlimited levels of trust, analysis, and compassion required to serve others in need drives my dedication and performance. Every aspect of my experiences – participating in research into the unknown, witnessing biologic responses that allow for a new day, and knowing patients like my grandmother who courageously continue through therapy – inspires me to contribute to the growing optimism medicine provides. Sweat was pouring down my face as I sat in the cinderblock shack that doubled as a makeshift medical clinic. Along with two other students, I’d been seeing patients for seven hours – we’d started early that morning. I was so red and sweaty that I looked as though I’d spent my day working out in a sauna. It was Guatemala, and I’d spent the last two weeks traveling through the country with a group called Global Medicine, which provided free medical care. We were a mix of about 20 college students and recent graduates from the US, an American doctor and his wife, a handful of Central American doctors, and local translators. On this day, we were back in Guatemala after a tour through the rural countryside, and even indoors the smog seemed thick enough to coat one’s body with grime. Our translator, Maria, brought in our next patient – a young, worried – looking man. After introducing ourselves, we asked why he’d come to the clinic. A flurry of Spanish escaped from his lips. He had a rash, which had been spreading for some time. He lifted his shirt to reveal a vast discoloration over much of his chest and abdomen. It looked like another fungal infection, something we’d seen a lot during our trip. Handing him the medicine, I explained what he needed to do and gave him a sweat-soaked slip of paper with instructions on it. Guatemala didn’t have pharmacies on every corner as we do in the United States so I couldn’t instruct the patient to buy the cream over the counter. The patient thanked us profusely. I was dehydrated, hungry, and tired, and plenty of patients remained to be seen that afternoon. As I watched him walk away, I thought about how different this experience was from my undergraduate years. I always planned to go into medicine, but my college career revolved around playing baseball. My days were filled with weight lifting early in the morning and practice in the afternoon. Classes were sandwiched in between. I was a student-athlete, but most of my focus was on the “athlete” side. My single-minded focus on baseball couldn’t last forever, and the bubble popped the spring of my junior year. It was the middle of baseball season, and it was going well – we had a winning record and it looked like we were going to qualify for the NCAA tournament. Since the tournament extends into summer vacation, my teammates were discussing how it would affect their plans. To my shock, many of my classmates were talking about having important-sounding summer internships at big banks and major corporations. I realized then that I had been distracted by baseball and needed to start actively pursuing my interest in medicine. I knew that my academic record wasn’t up to par. The Bs that I had considered perfectly acceptable early in college were below the averages for all medical schools. To demonstrate what I was capable of, I needed to perform well on the MCAT®. I put the same amount of energy into my MCAT® review as I normally did for baseball and performed well. My single mindedness about baseball also meant that I did not have time to pursue medically related activities during college, and I began to channel my focus to broaden my understanding of medicine. Working in the emergency department (ED) since I graduated from college has allowed me to learn about the day-to-day working life of doctors. I realize that doctors must be excellent educators so patients understand what is best for them. I am impressed by doctors’ mental stamina, essential for staying sharp during long shifts, their ability to find novel and clever solutions to problems, and their ability to stay calm during high-stress events. Listening to the doctors discuss their cases is one of the highlights of my job – I’ll often ask why they ordered a CAT scan instead of an x-ray, or what they are looking for on a chest x-ray for a patient with chest pain. I find these intellectual challenges appealing. My job has taught me about more than just what doctors do; I’ve learned about the patient experience as well. I’ve watched as overjoyed patients received good news, I’ve seen frustrated patients storm off after waiting for hours to be seen, and I’ve seen scared families trying to put on a brave face for their loved ones. I have gained an appreciation of how difficult it is to be a patient, especially in the ED. Our patients are sick, in pain, and scared and are questioned about personal topics while being examined by total strangers. Then they often wait for hours to find out their fate. Being a patient in the ED can be a lonely and frightening experience. I understand the importance of taking into account how vulnerable patients are while they are being treated. My job in the ED has given me a glimpse of my future career. Those eight and 12 hour days working at clinics in Guatemala didn’t feel like work. They were interesting and intriguing and reignited my passion for medicine. I have transferred all of the energy I used to focus on baseball to my future career in medicine. I am excited for the next phase of my education to help me reach this goal. If all this information has you staring at your screen like a deer in the headlights, you’re not alone. Writing a superb medical school personal statement can be a daunting task, and many applicants find it difficult to get started, or to express everything they want to say succinctly. That’s where MedEdits can help. 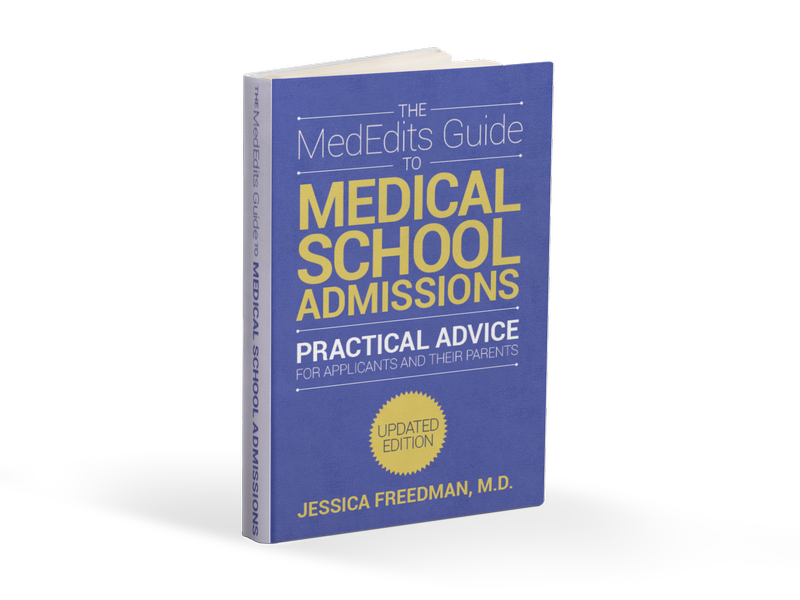 From personal-statement editing alone to comprehensive packages for all your medical school application needs, we offer extensive support and expertise developed from working with thousands of successful medical school applicants. We can’t promise applying to medical school will be stress-free, but most clients tell us it’s a huge relief not to have to go it alone.